Have you ever been to a dinner party or wedding and admired the glassware or silverware? There have been many times where I have sat down at a table and appreciated what was in front of me beyond the food and people. I have come to realize that what I’m truly admiring is someone else’s art. It’s not in the form of a sculpture or a painting, but in the form of a table setting. Table settings are thematic, chic, and even whimsical depending on the person putting it all together. On top of the style, there are many moving pieces from plates to stemware, and the ring that holds the napkin. Like most fine art, properly setting a table filled with crystal stemware and silver spoons comes with a hefty price. However, there is the option of renting everything you need for a table setting from your local rental dealer. 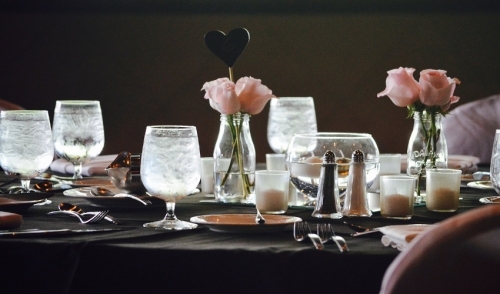 Renting your table setting will save you time, space, and money. Dinner parties and other special events are rare occurrences and even then, they are unique and no two are quite the same. Therefore, why would you buy a whole new table setting if it was only getting used once? This is where renting comes in handy because it offers you unlimited options to create a one of a kind table setting without breaking the bank and once the event is over, you can take it all back. Start your rental process by creating a plan of everything you might need for the table. Take out a piece of paper and jot down what type of plates you need, the sizes of those plates, the colors, the shapes, and the material you would like them to be made of. Plates are the focal point of any table setting, which is why it’s always best to start there and build around it. Once you know the plates you’re going with, you can start to add everything that goes around it from flatware, stemware, napkin rings, and mini utensils. Flatware if often available in silver or gold and comes in many styles. If you’re going with a more elegant setting, try sticking with something that’s vintage and not too flashy. Make sure to rent the right number of forks, spoons, and knives for each plate that is on the table. Stemware also comes in many styles and materials. Your rental dealer will offer several types of glasses including wine glasses, champagne flutes, water glasses, tumblers, and coffee cups. Think about your theme or goal and pick a style that best compliments your table. Napkin rings are always a nice touch to any setting, but not required. Some napkins are stylish enough on their own and feel free to rent the table linens to match. Contact your local rental dealer about your plan and discover what’s available to turn into a reality. Don’t be overwhelmed and stick with your gut. When in doubt, remember simplicity is one of the greatest forms of sophistication. You don’t have to be a pro to put together a unique table setting, you just have to have the right rental dealer. Don’t wait, start planning the table setting for your next event today.